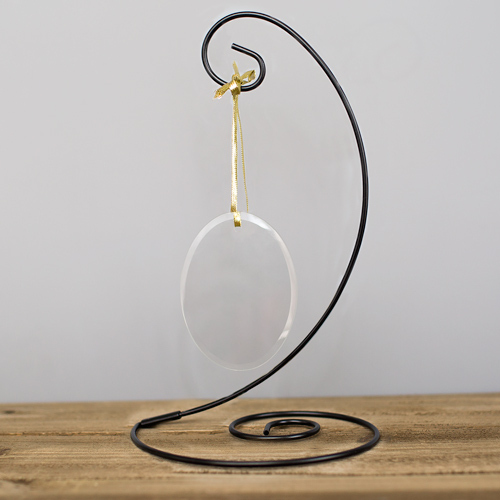 Our 10" Black Spiral Stand is perfect for displaying our glass and glass ball ornaments. Terrific for displaying special photo ornaments year-round. Some assembly is required. The base and top attach by inserting the top portion of the stand into the angled bottom base hole. When assembled properly it should look like this photograph. Personalized Christmas Ornaments are sold separately. Some assembly is required. The base and top attach by inserting the top portion of the stand into the angled bottom base hole. It's really nice and fits well with my Dads memorial ornament. When I ordered a number of personalized Family Word-Art Glass Holiday Ornaments I ordered one of these ornament stands for each one. With these stands the Holiday Ornaments can be displayed year-round. The stands are easily assembled and more than sturdy enough for this use. I'm very happy with them and would order more in the future. Additional Details Interested in more personalized Christmas ornaments? GiftsForYouNow has you covered, check out our great customized Christmas ornament designs. And no holiday home is complete without personalized stockings! Shop for yours today!